BREAKING NEWS: Men are wearing purses! But wait! 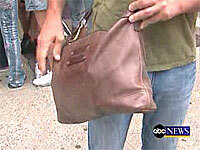 There’s more to the story: Andy Roddick doesn’t like man purses! Ah, but Roddick hasn’t won a tournament this year, Berman notes. So, uh . . . touché! But Chewbacca wears one! “And who would question his masculinity?”, Berman quips. Our favorite cameo in the report comes from an unidentified but suspiciously normal looking shoulder-bag-carrying man who shakes the reporter’s hand and says to him “Don’t make me look foolish” before walking away. If you missed last night’s program, you can view it on the Nightline website, or read the printed version more discreetly if you’re at work. But if discretion isn’t really your bag (and we realize that for many purse toters it isn’t achievable), Nightline is soliciting “video” responses to its report. That’s right: You can film yourself holding a man purse and send the footage to ABC! We bet the more foolish you look, the better the chance your video will be featured. Or take the opposite tack: make grunting sounds, insult bag carriers as pansies, then insist that your camera bag isn’t a man purse. What’s that sound we hear? Sharks, jumping? This entry was posted on Wednesday, July 26th, 2006 at 2:15 pm	and is filed under Commentary, Fashion, Man Bags, Public Image, Role Models, Shoulder Bags. You can follow any responses to this entry through the RSS 2.0 feed. You can leave a response, or trackback from your own site. As luck would have it, I happened upon Nightline for the first time in years just last night and saw this story. They’re not jumping the shark now. They already jumped when Ted Koppel left. Ol’ Teddy never would have done a fluff piece like this, which really should have been the closing human interest story on World News Tonight rather than Nightline. An awful lot of the “man purses” they showed looked just like soft briefcases worn messenger (cross-body) style to me. Still, how can you object to anything that gets the word out that men don’t have to be afraid of the bags? Um, why no mention that I have seen so far for the utility of these “man purses” to carry a man’s CONCEALED HANDGUN? 40 or more states now enable citizens to have a license to carry a concealed handgun. I guess this site is just too “cool” and “urban” to mention the fact that these bags can be used to comfortably carry a gun for personal defense. Of course, most defense experts will note (correctly) that “purse carry” is not preferable, because of the slowness of bringing the gun into action, and because of the possibility that the bag gets forgotten or snatched. But in some environments and situations, “purse carry” is a good way to go. Why is it so blatantly overlooked here? Iam man in my fourties. I have had a purse for about ten years now.It is a shame that I cant carry it without my wife being at my side. (that way people think Iam holding her bag). I’m 6′2 225 all man and I have no discomfort carrying a satchel…. if anybody doesn’t like it, I’ll break their nose…;o) Or if they try to rob me I will pull my leagally concealed .357 so the moral is be careful of real men that carry bags….. The article brings up Chewbacca, but for nearly 20 years I carried an “Indiana Jones” style Army surplus bag I picked up in Salzburg Austria. In College I used it to carry my allergy/asthma medicine, notebooks, manuscript paper, drafting tools, academic texts, CDs, whisky, reading and sunglasses etc. About a year ago I finally purchased a cellphone (apparently now another “trend” that is no longer just for nerds like they were in the 1980s). Because I was teaching at two different schools and didn’t have an office, I had two different burlap tote bags to carry all of my books (we’ve used these bags for groceries since we got married). Problem is I often forgot my keys, inhaler, or cellphone. So my wife of 15 years suggested I look for a smaller bag to carry everything in that isn’t as beat up as my now stitched together Army surplus bag which I hung over my should with an old piece of rope. I began looking online for a 19th century style ammo pouch but soon found they were way too expensive. I ended up going to the local thrift store and found 2 different bags that (at least to me) looked enough like ammo pouches (got them both for under $10). I showed my wife who acknowledged that I scored on finding 2 classic Coach black leather purses (turns out Coach is a well known brand name with outrageous prices) Anyway I now carry a Coach station bag) to hold my metronome, glasses, keys, allergy meds, leatherman utility, Boethius Consolation of Philosophy, wallet and pictures of the kids and cellphone.